Pruney and Suzi, For years I tacked ' a dog' on to the end of my Christmas list. You two have been the best gifts I'll ever receive. Prune, you came just before my 13th birthday and Suzi just as I was taking some of the most important exams of my life. And you know my life can be crazy, full. School work, applications, work experience. The blog, editing photos, fitting in runs, more work. My world just seems to be spinning really fast, my seasons keep changing. But amid all of that crazy are you both. The real center of my universe. What I won't do is say that because of you, every day feels like Christmas because that just wouldn't be real. But if Christmas is about goodness, light, and joy, then you two are Christmas. You two little monkeys light up my whole damn universe. Every. single. day. I wanted to make my dogs a cookie, something a bit festive for when I am stuffing my face with gingerbread. 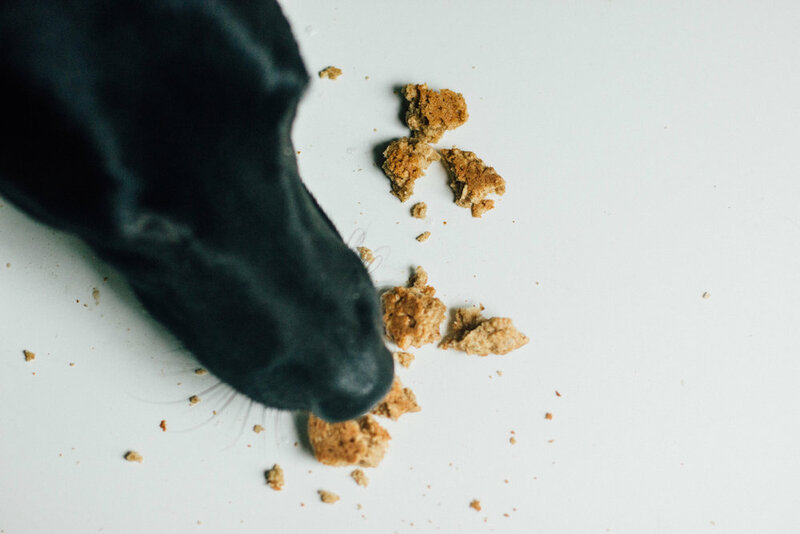 Dogs can have ginger - in fact, it's often used as a natural way of easing travel sickness, so if you are planning on taking your dogs on any car trips these holidays, these cookies might be fun to take along. They are totally gluten free so they are a little fragile, but my two monsters have been pretty good at cleaning up any crumbs :) they also come together in one bowl, with really only one measuring utensil, because your dog isn't going to care whether you spent four hours making them or 20 minutes. mine always do know. though, that they are homemade. They were eaten in a ratio of 10:2 Prune:Suzi, hence the photo of Pruney doing what she does best. Now your pup can join in the baking fun, it just for the holidays! 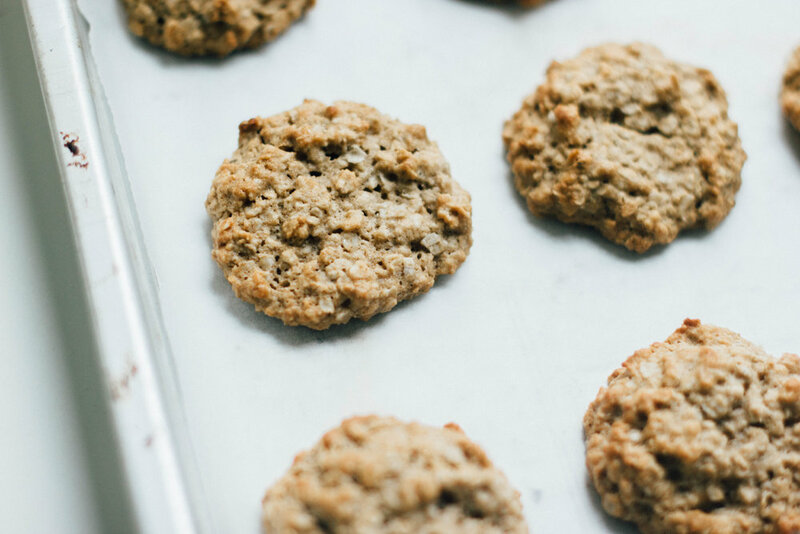 They are close to allergen free, just being oat based, but gently sweet and tender. Nothing stops you from adding a little more spice and keeping them for yourself. Preheat the oven to 160'C, 325'F and line a baking sheet with parchment paper. In a large bowl, add all the dry ingredients and stir to combine. Measure out the oil using a tablespoon measure, add to the oat mix. With the same measure, add the 3 tablespoons honey (it will slide off easily), then crack the egg into the bowl. Stir till evenly combined. 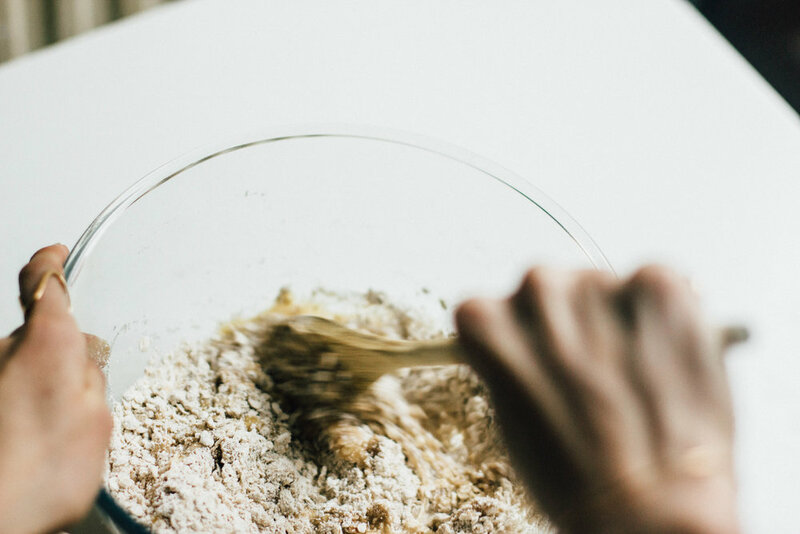 Using a medium cookie scoop or with a heaped tablespoon, spoon rounds out onto a lined baking tray, and flatten gently with the back of the spoon/scoop. Leave a little space, but they don't spread much. Bake for around 12-14 minutes till light golden. Allow to cool 10 minutes on the sheet then transfer to a cooling rack. They stay pretty tender, but will firm up with time and keep well in an airtight container for about 4 days. My monkeys usually finish the whole batch in 10 minutes after cooling. Warm cookie feasting... my dogs, no doubt. "go build your bridges", my mum wrote to me in an email recently. there's a bridge quite near where we live, across the region where two rivers meet. the traffic is usually moving slow, you have plenty of time to look around. on one side you look towards the town, it's one of the worst in the area, there are small houses that are black from the constant car fumes and there are only a few old barges anchored to a rotting metal quay. On the other side you look towards the heart of the Norfolk broads - flat and green, the river snaking through in a blue gray ribbon. the water's dotted with white sails, an occasional mill stands guard over a meander. the bridge itself is nothing special. some kind of vaguely brutalist structure with a bit of bauhaus, a white arch, metal suspenders, the kind that opens when big boats pass through. but we put a lot into each bridge we build. the bricks of connection, the mortar of motivation. some bridges are just that. some kind of a structure to get us through something, a simple crossing over some difficult terrain. almost selfish really, you see your end destination, the bridge gets you there. you're on the other side at new pastures, you burn the bridge. but others - others grow. the bridge still gets you over something. but maybe rather than a stream, it's a bridge over a deep ravine, strong enough to hold a cargo train. solid suspenders, a tall structure, never failing. sometimes you build roads coming up to that bridge, maybe starting with gravel but you cross the bridge so many times you end up paving it. and you realise, hey, I'm spending so much time around this bridge I need a little town, a few more roads, you hang a few baskets of flowers on the bridge. then you have a choice. you keep the sturdy bridge, the support that's held you up, that's allowed you to reach the greener pastures on the other side, but that's always let you come home when you need it. you keep it, or you burn it. I'm always burning bridges. often get as far as hanging the pretty flowers then one way or another, find a reason to light the match. when it's a bridge that connects two towns it's hard to choose one side, to watch it fall, so stand among the rubble, wonder whether you should put it back together. do you find that more and more your bridges never get that far? that you pour the diesel and light the match just after you build the structure - that you never really wanted the towns, you simply needed the bridge to get to the other side. you mow through your pasture, you build the next bridge, you burn it. the bridges I built and tried to keep when I was younger seem to give in to age. that the bridges I build now are built with the pure purpose of crossing over, finding something better, getting myself to greener pastures. We all do it. take on a job, cross over, find a better job, burn the bridge and leave it. we leave the rubble and pick up the next brick, find another place to put it down. preheat the oven to 180’C or 350’F. Line a cookie sheet with parchment paper. combine the flour, chopped hazelnuts, oats and cinnamon in a large bowl and mix to combine. add the wet apple mix to the dry mix and add the beaten egg to the large bowl. 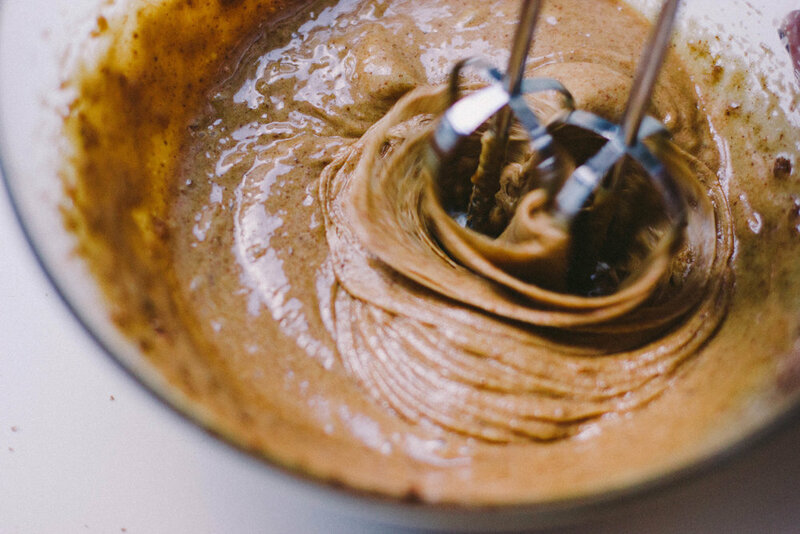 gently fold the mixes together till the dough becomes chunky and moist. 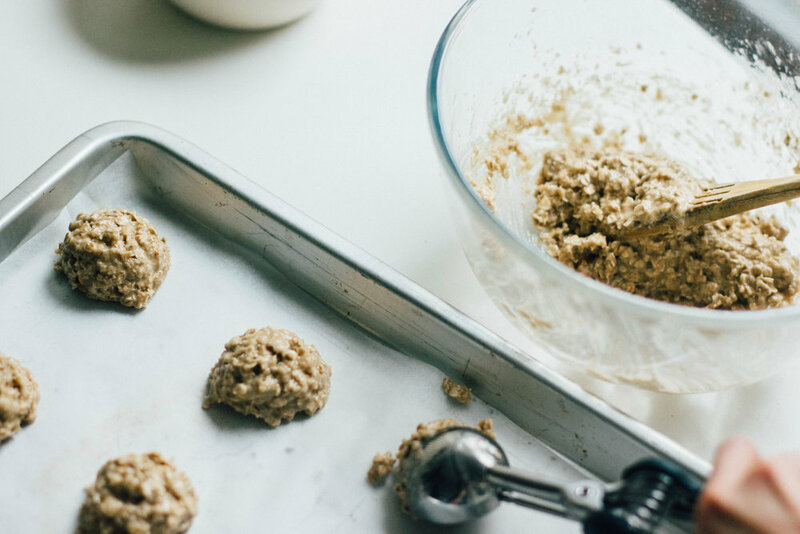 using a medium (1.5 tablespoon) cookie scoop, scoop out balls of dough on the cookie sheet. flatten them gently and don’t worry about leaving much space between, they don’t really spread. bake 16-18 minutes, till the cookies are slightly golden. allow to cool on a cooling rack and enjoy. the cookies will keep for around 4 days stored in an air-tight container in the fridge. *as I said above, to make these gluten free, I’d recommend using 1/2 a cup (50g) almond meal in place of the spelt flour, and just make sure you use certified gluten free rolled oats. if you’d like bigger cookies, feel free to use a larger scoop and bake them a little longer. ** I used blanched hazelnuts since that’s all I could find, but you could use skins too, they will just make the nutty flavor much more pronounced. not necessarily a bad thing. Adapted from BBC Good Food.